Increasingly complex battlefield exercises – which mix live and virtual elements – rely on precise tracking of warfighters. However, location capabilities have lagged significantly behind the training technology. A California-based small business recently took a big step towards bridging that gap by participating in a new technology acceleration event. 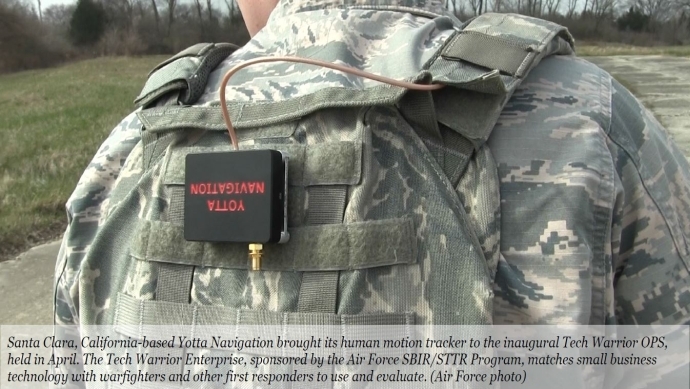 Santa Clara-based Yotta Navigation brought its human motion tracker to the inaugural Tech Warrior OPS, held in April at the National Center for Medical Readiness, a Wright State Research Institute Laboratory in Fairborn, Ohio. The Tech Warrior Enterprise, sponsored by the Air Force Small Business Innovation Research/Small Business Technology Transfer Program, matches small business technology with warfighters and other first responders to use and evaluate. The tracker is a smaller device in a larger system, the Mobile Activity Tracking System. Also known as MATS, the system tracks operators during live exercises using a combination of GPS and other machine learning algorithms. MATS is designed to work when the warfighter enters GPS-challenged environments, such as tunnels or the interior of a building. The company began work on MATS with support from an Air Force SBIR contract managed by the Airman Systems Directorate, a part of the 711th Human Performance Wing in Air Force Research Laboratory. The newest and most innovative ground-based training happens in a live environment while a computer system is used to add virtual elements viewed by participants through special goggles. This has been difficult to implement because of a lack of long-range precision tracking capabilities. Perfecting a system such as MATS would facilitate improved training on a widespread scale and be a significant win for the Air Force as well as other services and combatant commands. Tech Warrior OPS allowed Yotta Navigation to get an early version of the system into the hands of potential operators. Feedback from the event gave the company a better understanding of how its technology could be improved to compete in the next phase of the Air Force SBIR/STTR Program. In addition to Tech Warrior OPS, the newly expanded Tech Warrior Enterprise includes the annual Operation Tech Warrior exercise in the fall and Tech Warrior CONNECT events, which provide one-on-one assistance to small businesses throughout the year. All facets of the Tech Warrior Enterprise are intended to transition technology quickly to the field. Participation is Tech Warrior events is free for companies, which only pay for travel and related expenses. Any small businesses with an Air Force research and development contract, especially those involved in the Air Force SBIR/STTR Program, may request to participate in the Tech Warrior Enterprise by working with its government contact or by contacting twenterprise@wright.edu.